A myriad of non surgical face lift options have recently flooded the market over the last few years, gaining national attention from the National Enquirer, the Today Show, Good Morning America, and Oprah. 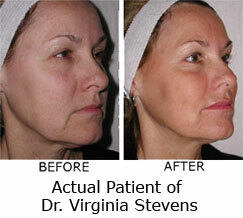 Thermage and Venus Freeze direct radiofrequency energy just below the surface of the skin into the collagen. Over the next several months, the skin will slowly begin to produce more collagen, filling in the lines and grooves in your skin and producing a younger, more vibrant appearance. The Titan ("tighten") by Cutera, is another non-surgical process that uses an infrared light source to tighten skin and reverse the signs of aging. The Titan heats the dermis to cause collagen contraction while preserving the epidermis through continuous cooling. In addition, Titan can stimulate long-term collagen rebuilding that leaves patients with younger looking skin. Threadlift, also called thread face lift, is a one hour procedure which involves the threading of monodirectional sutures through the subcutaneous layer of the face. The threads are tightened and anchored in the hair line, giving new lift to the skin and stimulating new collagen production around the threads. Some other names commonly associated with thread face lift are ThreadLift, Russian threads, Aptos threads, S Lift, Curl lift, featherlift, contour lift, and string face lift. 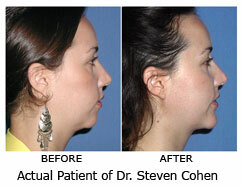 The Endotine endoscopic face lift uses similar technology but is used only to lift the upper face. Only a physician can answer questions regarding the differences in technology and efficacy. Injectable fillers can be used for non-surgical face lift, when a patient's skin is in good condition but is beginning to show deep lines and furrows. Known by names such as VolumaLift, injectable face lift, Liquid Lift, and Filler Facelift, these treatments are excellent short term solutions for reducing the appearance of age and achieving a softer profile. Botox, the most popular cosmetic procedure on earth, can be the most inexpensive and instant non-surgical face lift when performed by an experienced Botox injector. Surprisingly enough, blepharoplasty is the most common of all cosmetic procedures performed in the United States, used to refresh the area surrounding the eyes. A blepharoplasty is a surgical procedure, but is less invasive than a full face lift and can provide excellent results standing alone. Other less invasive surgeries that can dramatically improve facial appearance without serious downtime are the procedures which reshape the ears, chin, or nose. People of all ages who dislike certain attributes of their facial features choose ear surgery (otoplasty) to minimize the angle of the ears to the head, or chin surgery (mentoplasty) to create a more defined jawline and eliminate that "weak chin" effect. Rhinoplasty is also very popular for those seeking a more aesthetically pleasing nose, either post-injury or just to streamline the profile of the face. A traditional surgical face lift will often integrate components of all of these procedures and include a reduction of excess facial skin secured above the hairline. If your face or neck has begun to sag but you have strong well-defined bone structure and still have some elasticity in your skin, a facelift can set the clock way back on your facial appearance. 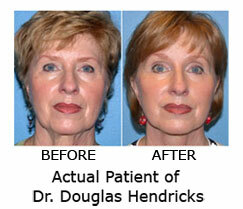 The underlying facial muscles are tightened, excess fat is removed, and the skin of your face and neck is repositioned. If a surgical face lift is too invasive for your needs or you don't have the time to undergo the lengthy recovery process, there are a number of other treatments that can produce almost the same effects. Often the simplest and most pleasing method of bringing new life to a tired face is a cosmetic filler or injectable filler. Products like Botox, Restylane, Sculptra, Hylaform, Captique, CosmoDerm, CosmoPlast, Radiance, and Radiesse are derived from naturally occurring sources within the body, either hyaluronic acid or collagen. 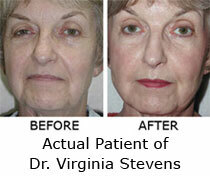 Results are immediate and last for several months or years, depending on the product.